All CIRCA research projects and products on waves and coastal flooding are listed on the Coastal Flooding & Waves Projects and Products site. There you can find a description of ongoing projects and any products from the project, including tools, reports, data, presentations, etc. Below is a general description of coastal flooding and waves impacts. CIRCA works to enhance coastal resilience to coastal flooding in Connecticut. Coastal flooding is caused by waves, storm surge, and high tide, particularly with increased sea levels. In coastal areas where there are also rivers, rainfall contributes to coastal flooding as well. Coastal flooding occurs during hurricanes and less intense storm events, i.e. tropical storms or nor’easters, due to waves, storm surge, and rainfall. As the sea levels rise, the frequency of coastal flooding during all storms will increase as well as the total flooded area at high tide. Flooding that occurs during small storms or at high tide is often referred to as “nuisance flooding.” As sea levels rise, the frequency of nuisance flooding will also increase. 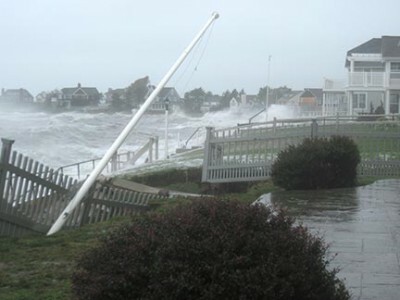 CIRCA’s research projects investigate the particular impacts of coastal flooding on Connecticut’s shoreline. The general projections of the impacts of extreme weather and climate change above do not account for how those trends will play out at the municipal scale in Connecticut. The varied features of Connecticut’s coastline, its marshes, small beaches, and rocky headlands, determine how and where flooding will occur. CIRCA’s research incorporates these coastal features as well as the unique ocean dynamics of Long Island Sound to determine wave height and force, projected storm surges, the frequency of flooding due to those storms, and sea level rise.